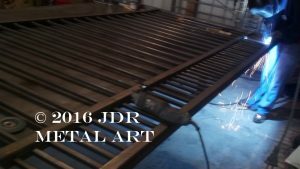 May 2016 - Custom Driveway Gates - Iron Steel & Aluminum - JDR Metal Art - FREE Standard Shipping! 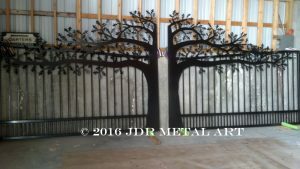 Here’s another fantastic looking tree themed driveway gate custom built and delivered by JDR Metal Art, this time for a beautiful farm located near Topeka, Kansas. 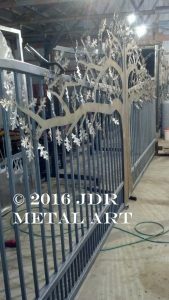 We design and build metal art driveway gates for customers nationwide. 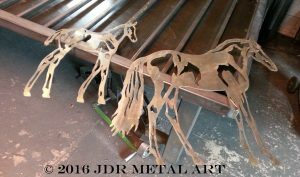 Every gate is a work of art that is built to last a lifetime. 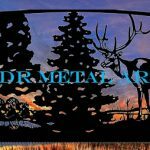 We take great pride in being able to conceptualize nearly any design theme. 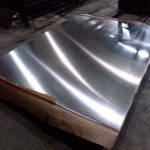 We love turning our clients dreams into reality! 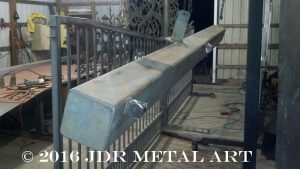 These gate posts are 6x6x1/4″ square tubing with the gate opener brackets and hinges welded in place so the installation will not require any welding onsite. Our client shipped the gate opener brackets to us. 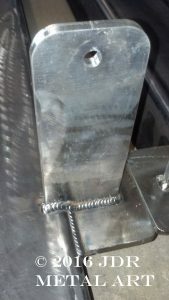 We welded them in place according to the gate opener installation manual. 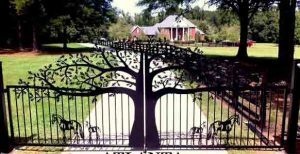 Our client opted to go with the Apollo T7 dual swing gate opener. We Deliver to our Customers! 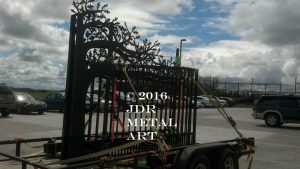 Being over 8′ tall, these gates were too tall to crate & ship so we loaded them up on the trailer and personally delivered them.